The CAGC membership year covers the period from July 1 to June 30 of the year that dues are paid. Annual membership renewal takes place July 1. Please note there are no pro-rated rates for membership dues. If you are already a current CAGC member looking to renew please use the 2018/2019 Membership Renewal form. If you are a current Student member upgrading to Full member status please contact the CAGC Administrative office at cagcoffice@cagc-accg.ca for further instruction. Payment can be made online using a credit card or by cheque to the CAGC Head Office. Please make cheque payable to the Canadian Association of Genetic Counsellors. Once a completed application is received by Head Office and full payment, the application will be considered by the CAGC Membership Committee. Decision letters will be sent to applicants by e-mail. 3. Membership in the Corporation shall be limited to persons interested in furthering the objects of the Corporation and shall include those persons whose application for admission as a member has received the approval of the board of directors of the Corporation (the "Board") in accordance with the rules for membership as adopted by the Board from time to time. Membership in the Corporation is restricted to the following classes: (1) Full Members; (2) Associate Members; (3) Student Members; and (4) Emeritus Members herein to be known as a "member" or "members". 4. Full Members: Full Members shall include those individuals whom the Board has admitted to the membership of the Corporation from time to time. 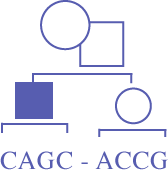 The following persons are eligible for full membership in the Corporation: (i) any person who holds a Diploma, Master's or Ph.D. degree in human genetics from a program established for the training of genetic counsellors and/or genetic associates, or (ii) any person who is a Canadian certified genetic counsellor or holds an equivalent qualification from a recognized genetic counselling certification body, or (iii) any person who is a Registered Nurse, or has achieved a Bachelor's, Master's or Ph.D. degree in a related field such as nursing, social work or public health and whose primary responsibility for the equivalent of one year's experience over the 3 year period prior to application for membership has been providing genetic counselling in a medical setting or in a setting otherwise approved by the membership committee. Full members in good standing shall be entitled to notice of and may attend all meetings of members, vote, hold office, and serve on the Board, committees, as a regional representative and as editor of the Corporation's newsletter. 5. Associate Members: Associate Members shall include (i) applicants who are physicians and whose interests focus on genetic counselling and (ii) applicants whose interests focus on genetic counselling and who are not eligible for or who do not desire full membership or student membership. Associate members have all privileges of full members except they may not vote, or serve on the Board, or as Chairperson of a committee. 6. Student Members: Student Members shall be extended to bona fide students in a post secondary institution. Student members shall have all the privileges of associate membership. 7. Emeritus Members: Emeritus Members shall include those members upon whom the Board has conferred an honorary membership and shall entitle the Emeritus Member to such privileges and benefits as shall be determined by the Board. Subject to the By-laws herein and the Letters Patent of the Corporation, emeritus memberships shall terminate upon the member's death or upon the expiry of the period of membership where applicable. Emeritus Members shall have all privileges of the Associates Members. I understand that by joining the CAGC I will enjoy the benefit of receiving periodic emails regarding research studies, job postings, etc. that the association deems of interest to members. Personal information such as email or mailing addresses will not be sold. All details noted with an asterisk will appear in the CAGC Membership Directory located in the password-protected section of our website. Please provide the information as you would like to see it listed in the directory. The CAGC BOD has developed 7 Communities of Practice with the idea of connecting counsellors with expertise in a given area to act as a network across the country and as a resource to one another. The CAGC Board of Directors may ask a CoP to undertake a project of value to the entire CAGC membership (e.g., patient education materials, practice guidelines). Alternatively, a CoP can initiate such a project themselves. There is no obligation to participate in projects as a member of a CoP. If you are interested in joining any of the CoPs, please contact the leaders directly by email.